According to Capcom, future Resident Evil games will narrow their focus to better appeal to core fans. Resident Evil has never been the most widely-played videogame franchise, but it certainly has a loyal and dedicated fanbase. Trouble is, you wouldn't know that from looking at Resident Evil 6, which was widely panned by reviewers and long-time fans alike. 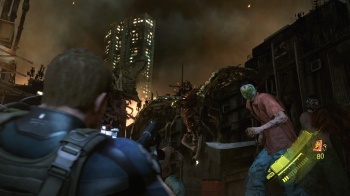 For many, the biggest problem with Resident Evil 6 was that the game moved too far from its survival horror roots, dropping the tense, resource-focused gameplay in favor of run-and-gun action. While that's only part of the problem (other survival horror franchises didn't make that transition so poorly), Capcom has heard the message, and has promised to rededicated future sequels to Resident Evil's core fans. "We have obviously seen the consumer response and the PR response," said former Capcom marketing head Michael Pattison. "There was some great positives out of that, but it was a mixed bag, as we saw from the review scores. We have got to take that on-board, we can't ignore that, and we have to take that onto the next game when we make the next Resident Evil." One of the biggest differences between Resident Evil 6 and previous games was its three separate story campaigns, each of which embodied a different tone and gameplay style. While that's certainly an interesting idea on paper, in practice it fractured the game to a point where many players were confused about what Resident Evil 6 was supposed to be. "With Resident Evil 6 specifically, we probably put too much content in there," Pattison continues, "there were comments from consumers that said it felt bloated. The Leon missions went down very well, and because we did Resident Evil Revelations on 3DS, there was a cry out for us to focus our attention on survival horror, rather than be too many things to all people. You'll find where we go next will likely be more targeted at our core fanbase."